CarGurus has 1,304 nationwide S5 listings starting at $10,499. For sport and style, it’s hard to beat the S5. For those who need more go than the traditional A5, but don’t want to cross over into the power or price range of the RS 5, this is the sweet spot. Stout handling, precise steering, style in spades… and it even comes with a manual option. How do you make one? Take a standard A5 and tweak it with a lower sport suspension, upgraded brakes, sport seats and a flat-bottomed steering wheel. But that’s just the start. A major selling point of the S5 is its supercharged V6. While the turbo 4 in the A5 is a fun, fast powerplant, some just can’t get past the perceived stigma of a 4-cylinder engine. Others just like the sound of 333 supercharged horses. And while some V6 examples can provide a rough feeling when pushed, Audi’s 3.0-liter stays smooth all the way to its 6,800-rpm redline, a very good thing since peak power doesn’t arrive until just 300 rpm short of the limit. Thankfully, 325 lb-ft of torque are available from 2,900 rpm, so you won’t be swimming in horsepower dip the entire time. What you need to do is decide how you want that power delivered. It’s going to all 4 wheels, but you have the choice of a 6-speed manual or a 7-speed S tronic automated manual—both smooth, stellar options that’ll leave you smiling. A bit of a disappointment is the optional sport differential. Surely given that this is an S5 rather than an A5, the sport differential should be standard. They all start with “S,” after all. But with it equipped, the S5 can vary power delivery to the front or rear wheels by a substantial percentage, with up to 75 percent going up front and up to 85 percent getting allocated rearward for a true sports-car feel. In optimal conditions, the setup will propel the S5 to 60 mph in anywhere from 4.6 to 5.3 seconds, depending on whether you choose coupe or cabriolet. But don’t let the numbers lie to you—everyone knows convertibles are faster on the road and coupes are faster on paper. You’re not driving on paper, are you? Sadly, fuel-economy figures are less impressive and getting increasingly so with every passing year. The best the EPA can estimate is for the coupe with the automated manual, which returned 18 mpg city/28 highway. That's hard to swallow when Ford’s naturally aspirated V6 will crack 30 mpg and still deliver 300 hp. But this is no Mustang, and if a shot of the exterior doesn’t convince you of that fact, simply sitting in the driver’s seat should do the job nicely. Starting with the Premium Plus trim (“lower” Audi models start at just Premium—oh la la), the S5 gets standard 18-inch alloys, xenon headlights and LED running lights, keyless entry and ignition, a tilt sunroof for the coupe, tri-zone automatic climate controls, leather upholstery with simu-suede inserts, heated sport seats with 8-way adjustability, dash-mounted MMI infotainment and navigation system with a 6.5-inch display and heated side mirrors. 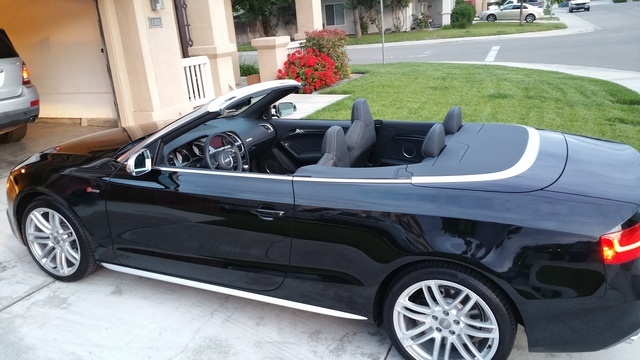 Convertibles get a power soft top that’s one of the better examples of the tech in the industry as well as upgraded heat-resistant leather upholstery. Plus, both versions get Audi Drive Select, which offers control over steering and transmission. Move up to the Prestige trim and you’ll add a lot of luxury and weight to the nearly nimble S5. A Bang & Olufsen stereo is a nice touch (and really should be standard), and the blind-spot monitoring system will help avoid freeway merging catastrophes. The MMI Navigation Plus package is included as well and upgrades the system to the slightly less frustrating version with the console-mounted controller and deceptively larger 7-inch screen, as well as voice commands. You’ll also get parking sensors front and rear with a rear-view camera. The Driver Assist Package can also be added here for adaptive cruise control and steering, while a Comfort Package can be added to either trim for ventilated seats and heated vents for your neck in the convertible. You can also add things like the aforementioned sport differential (recommended) adaptive dampers (recommended) and 19-inch wheels (not so recommended). While the S5 handles rippled pavement and potholes with appropriate posture, the 19-inch wheels do nothing to help that situation. Look good they may, but drive well they do not if reviewers and owners can be believed. I say, trust ‘em. Still, the S5 has plenty of competition from rivals like BMW and Mercedes with the 435 and the C350. At this point however, we’re talking about personal preference rather than any clear winner. Pick your poison and savor the sporting sensations. It’s hard to go wrong here, if you’re willing to weigh in and wrestle. What's your take on the 2015 Audi S5? 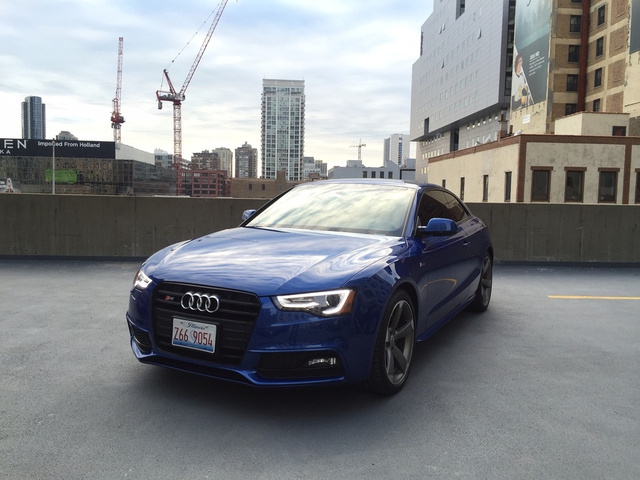 Have you driven a 2015 Audi S5?